This is the ideal game for anyone who loves riding and horses! You can mainly get it in England or the UK but it is everywhere, well, if they have DS there. You get to choose your horse from 7 different breeds and you choose it's coat, you also get to customize the hair, markings and so on. Your foal gets born and the story starts. 3 years later in game time, your horse grows up, and you take care of it and train it for competition. As a young rider the main story is to compete against a really competitive girl called Melanie, who thinks she is the best rider. Along the way you unlock things. The shop is full of stuff and I can never stop visiting it. You get to ride in many different environments in different places. There are more than 15 tracks to unlock in the game. You travel overseas from your home to the US and Africa to compete in various competitions. You also do diplomas. It's pretty cool because the game is all 3D, and it is easy to use and play. It's also because you can take pictures with a camera and you jump over rivers and stuff. 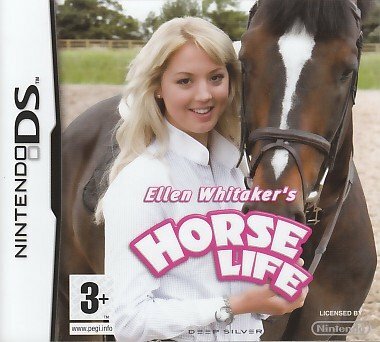 I recommend this game for everyone and every horsecrazy person. I have this game!! Except it's called horse life adventures, and the cover is not the same. it's cover is pink, and it has a horse and rider jumping on it. You can choose color, breed, hairstyle, and markings. I got this for my b-day, and I loved it. I totally recommend this for anyone who likes horses. I just can't figure out the title difference.